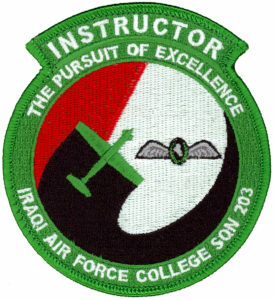 On 16 Dec 2009, simultaneous with the delivery of the first batch of four Beechcraft T-6A Texan II, the Iraqi Flight Training School became the Iraqi Air Force College and moved to Combat Outpost Speicher. The initial four aircraft equipped the 3rd Training Squadron. The final batch of four aircraft left the USA on 8 Nov 2010 and arrived in Iraq the following day, coinciding with the first graduation of 20 new Iraqi pilots — eight on fixed-wing and 12 on rotary-wing types — bringing the total number of pilots trained to 102. Initial flight training on the T-6A began on 20 Mar 2010, under the instruction of the U.S. 52nd Expeditionary Flying Training Squadron. In 11 Jan 2011, the 3rd Training Squadron became the 203rd Training Squadron. On 5 Sep 2011, 11 trained Iraqi instructors took over from the American instructors.